How do you Monte Cristo? At Stoke’s Grill in the north hills, they don’t make it like momma used to make. A monte cristo has the following key components: ham, turkey, cheese, and french toast – or bread and egg. At this north hills cafe-style, byob restaurant, they actually make the sandwich of meat and cheese on bread, dip the whole sandwich in an egg batter and quickly deep fry it. The sandwich doesn’t come out of the kitchen looking like a sandwich, but one bite and you know that you have found a very, unique Monte Cristo! 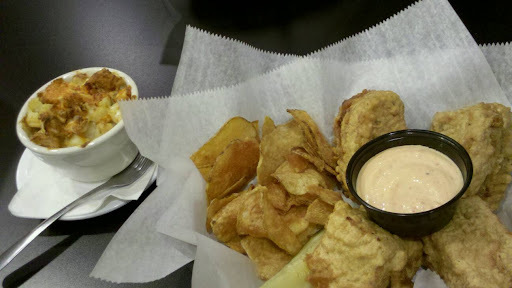 As a side, in the picture is one of @eatatstokes (on Twitter) newest creations. White macaroni and cheese with buffalo chicken. It’s available as a side or an entree. My side was actually a filling portion, much more than a soup or chili. The buffalo chicken had good buffalo flavor, but the mac n cheese was oily at the bottom. If they can hone in on this recipe, then it could be a hit. As of right now, I think it could use a little work.